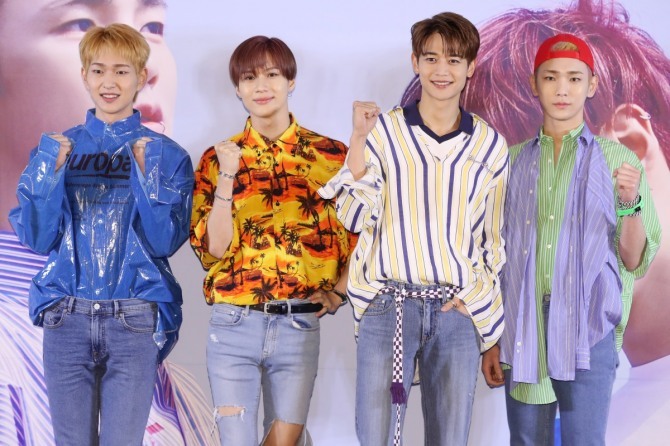 Having spent a tumultuous decade in the K-pop industry, SHINee said it was proud to celebrate its 10th anniversary. “Looking back, I feel pride in ourselves. For me, I’ve spent half of my life as a SHINee member, since I started my trainee life when I was 13 years old. There were times we argued with each other, but now we read each other’s thoughts without speaking,” said Taemin at a press conference held in Seoul on Monday. The originally five-piece act released “The Story of Light EP.2,” the second part of the group’s sixth studio album and its first album as a quartet following the passing of member Jonghyun last year. “We’ve done almost every genre out there. And now, maybe it’s time to reinterpret those genres into our own way. With years of our experiences, all of us have widened our spectrum,” Taemin added. Minho also shared that the bandmates renewed their contracts with their longtime home S.M. Entertainment. Marking its 10th anniversary, the band plans to release a total of three EPs throughout the summer, with its first EP “The Story of Light EP.1,” released on May 28. Key explained that each EP holds a different message, with its first and second EPs embodying how SHINee is viewed by the public and how the members think of themselves, respectively. “The third single will be R&B, and will have a much different tone than the previous two,” he said.